A man driving an ATV through water and mud in the woods. Known as the “Land of 10,000 Lakes," Minnesota is a popular state for camping. But something Minnesota is not as well known for is its large number of ATV trails. As one of the top-20 most-forested states in the U.S., Minnesota has hundreds of trails -- many of them especially for 4-wheeling. Before heading out on the trails, familiarize yourself with Minnesota's regulations. 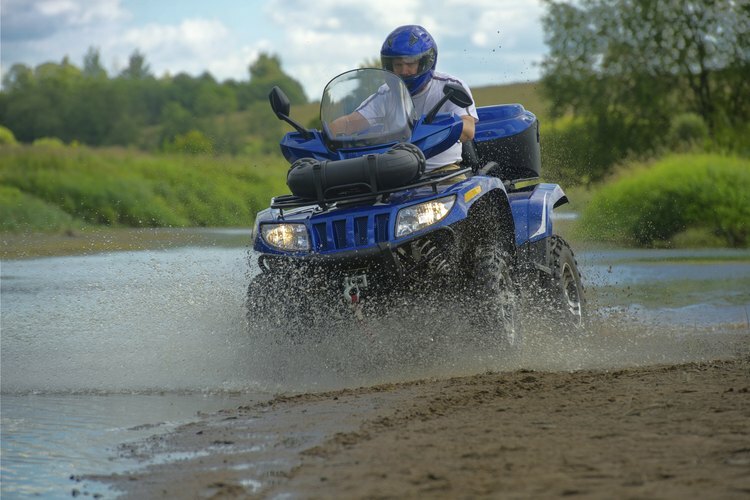 A valid driver's license is required to operate an ATV in a ditch or other road right-of-ways; a person under the age of 18 is not allowed to carry passengers; and youth 11 to 15 are required to complete ATV Safety Training. Familiarize yourself with all of the rules on the Minnesota Department of Natural Resources website. This trail is located in north-central Minnesota and is one of many trails in the Paul Bunyan State Forest. The 115,113-acre state forest has a hilly terrain with many ponds and bogs. The Round River Trail runs through some of the more diverse terrains of the forest, allowing you to see small lakes and flora and fauna. The Paul Bunyan State Forest has four primitive campsites for bikers to use. An abandoned railroad, the Agassiz recreational trails consist of 52 miles of trails running through Fertile, Ulen, Twin Valley and Crookston along Highway 32 in northwestern Minnesota. There are several river crossings along this trail, and depending on weather conditions, parts of the trails may be blocked off or closed. Voyageurs View campground is located off of Highway 32. They have tent sites as well as sites with electricity and water. Located in central Minnesota, the St. Croix State Forest is along the Minnesota-Wisconsin state line. Boulder Campground and Tamarack Horse Camp are the two campgrounds along this trail. There are approximately 45 miles of ATV trails in the forest. According to ATV Magazine, the St. Croix trails are rated as difficult and best suited for intermediate and expert riders. This 7-mile trail is located in Richard J. Dorer (RJD) Memorial Hardwood State Forest, and offers scenic views of the Trout, Whitewater and Mississippi River valleys. RJD Memorial Forest is located in southeastern Minnesota, and has seven primitive campgrounds available for trail users. Amber Yake has been writing professionally since 2008. She has experience writing for several online and print publications, including the Low GI Meals website, the "Kamloops Daily News" and providing travel-related articles for LIVESTRONG.COM. She has a Bachelor of Journalism with a major in public relations from Thompson Rivers University in Kamloops, B.C.